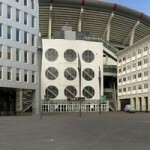 Amsterdam Arena is not only the official arena of Ajax Amsterdam, the football club, but it is also the host of the biggest concert events in all of Amsterdam. For concert the stadium has a capacity of between 35,000 – 50,000 people (depending on where the stage is placed). Among the famous artists who have performed at Amsterdam Arena we should mention for example Tina Turner, Madonna, Michael Jackson, Céline Dion, George Michael, Bon Jovi, Eminem, Robbie Williams, Red Hot Chili Peppers, Justin Timberlake, The Rolling Stones, Genesis, Backstreet Boys, U2, AC/DC and Metallica.